Looking for a quick review of technologies to use related to social networking, accessibility, and autism? Check out the websites and apps below, apps are iPad or iPhone apps, some apps are also available for android phones or tablets. Each review contains the following components: Image (ScreenShot), Name of Website, Software or Hardware, Company, web address, price, specs (as appropriate) (web address accessible with NAME as the link), Content and purpose related to UDL & Diversity (as appropriate to your topic but discuss match between learner characteristics and resource), Strengths and Weaknesses related to Instructional Design, Appearance, Ease of Use and matching to the type of learners, UDL Considerations. Autism Xpress is a free app that encourages people with autism to recognize and express emotions. The app is designed to help teach recognition of emotions and facial expressions-a challenge for most children with ASD. The app displays 12 buttons, each a cartoon caricature of a facial expression of how one feels: happy, sad, hungry, etc. Pressing a button creates a full-screen image of that emotion. Color blindness or physical dexterity issues may prevent some users from accessing the brightly colored touch-based interface that requires a smartphone or tablet. Families and schools with AT and/or students who are physically able will likely benefit from the app. Modifications may be required for people with physical limitations. Website passed WAVE. Leibs, A. (2013). 5 iPad Apps for Autistic & Developmentally Disabled Children Apps Help Autistic Children Communicate, Interact with Others. The Grace App for Autism helps autistic and other special needs children to communicate effectively, by building semantic sequences from relevant images (Picture exchange system) to form sentences. The app can be easily customized by using picture and photo vocabulary of your choice. With Grace, users select pictures to form and semantic sentences others can read on the iPad screen. Grace comes with a basic picture vocabulary. Stored images can be added to each category. With practice, users can attempt their own speech and use the pictures as a back-up. 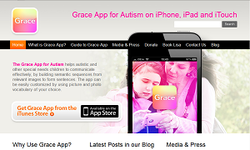 The Grace App Manual, an introducing to augmentative communication is also available free on the site. iConverse is an Augmentative Alternative Communication (AAC) application for the iPhone and iPod Touch that replaces bulky and expensive communication devices used in the past. iConverse is designed for children with autistic and other communicative disabilities who have not yet mastered basic speech. The app has six communication tiles representing needs such as food, break, bathroom, etc. When touched, the icons give an auditory and visual representation of the specific need or want. Built-in text-to-speech enables parents to customize the app by recording their own voice. Modifications may be required for people with physical limitations. Website passed WAVE except for a logo with alt text (other relevant text associated with image). App is designed for broad use and with accessibility features – video and audio, clear text, representative image/text combinations. Website contains images without captions or alt text. 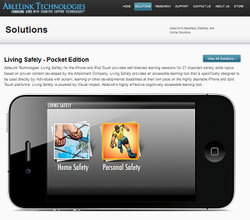 Living Safely provides self-paced learning on 27 safety skills for individuals with autism and developmental disabilities. Living Safely also uses the AbleLink Instructional Media Standard (AIMS) that provides step-by-step multimodal instruction using visual and auditory media. The cognitively accessible learning sessions include home and personal safety, strangers, and sun and cold-weather safety. This app is designed as a resource for all children and has video and audio components that make it inclusive for people with or without recognized disabilities. However students with LD or other challenges may find that this app helps them to organize thoughts for the writing process and can create their own social stories to help students with ASD or other conditions adapt to social situations. Story Builder enables children to create, record, and share narratives in their own voice. 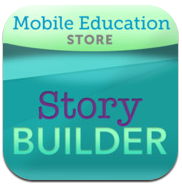 The app includes 50 form-generating story lines and 500 audio clip questions to guide narrative development. Each student gets their own archive page and can share stories via email. Story Builder is designed to help children form paragraphs, integrate ideas, and make higher-lever abstractions from inferences. Requires an ipad/iphone and the ability to use that device which does contain some embedded accessibility features. Any accommodations used to allow a user to use the ipad device would enable the user to use the app. 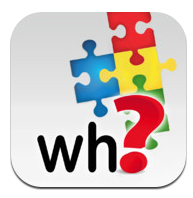 Autism iHelp Wh questions Series of Apps cost $1.99 each. Autism iHelp - WH? 's consists of questions paired with appropriate real world picture responses. This app includes several photos and questions chosen based on established expressive language milestones. Autism iHelp - WH? 's address a very specific area of higher level language need in the Autism population. Through routine learning, children learn labeling of concepts. WH ? 's require incorporating more abstract thought and generalization in regard to the learned concepts. Children with Autism often have difficulty with this particular skill, and Autism iHelp - WH? 's apps are an excellent way to target a vital educational benchmark in a mobile capacity. Clear clean creative design concept, attractive appearance, and easy to use format that matches the characteristics of the identified audience. 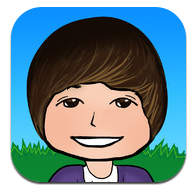 Find Me is an app designed to help young children with autism practice simple social skills. It is suitable for play by children with an ability level equivalent to 18 months or over, and doesn’t require any language or reading. In Find Me, the aim of the game is to find the person in the scene and tap on them. As the levels increase, it becomes harder to spot the person as more and more distracting things (plants, animals, toys) appear in the scene. This app has a free and pay version, the free version is the earliest levels that are the most basic. The art and design is attractive, there are extensive explanations preceeding the game which may cause users to lose interest, and the navigation was not intuitive for me, some sections are required to be reviewed and cannot be skipped. The app meets the specifications and is suitable for its intended audience. Free Lite Version and Videos available from website. It is designed to familiarize children with locations that may be challenging, and to help teach appropriate behavior in these locations through peer modeling. App and site are video/visual interface based and quickly draw the interest of most visually-able viewers. The videos present models of behavior and language skills that are appropriate in specific situations. The app and videos provide direct instruction for children with Autism in language skills and behavior in social situations. App previews and gives descriptions of videos, allows purchase of videos, and quick suggestions best suited for older users or caregivers. 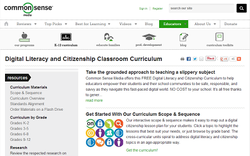 UDL/Accessible curriculum to teach web safety to students K-12 for teachers or parents. Web and media evaluation information available as well. Site has a clean clear design, with white, black, and green as primary colors, images have alt text or supplementary text links/captions. Lessons are available as pdfs, however content is also presented in video or PowerPoint. Teachers/parents have control over accessibility. Some of the embeds were problematic in the Chrome browser and many images lack alt text with long captions featuring links without descriptive text. Overall appearance is attractive. Free items are text or video based, additional resources may be required to make information accessible for those with visual disabilities or difficulty reading. “MTV's A Thin Line campaign was developed to empower you to identify, respond to, and stop the spread of digital abuse in your life and amongst your peers. The campaign is built on the understanding that there is a "thin line" between what may begin as a harmless joke and something that could end up having a serious impact on you or someone else. We know no generation has ever had to deal with this, so we want to partner with you to help figure it out. On-air, online and on your cell, we hope to spark a conversation and deliver information that helps you draw your own digital line.” Site sponsored by diverse groups and contains a youth-oriented approach to internet safety suitable for older teens and adults and includes interactive components. The site takes advantage of multimedia and embedded technology that may not work well with a screen reader or other assistive devices. The site is appealing to young adults. As noted, site may not work with some assistive devices, some links/buttons are small, some images do not have alt text, several content sections are entirely flash based. Content may be adapted to more accessible formats. 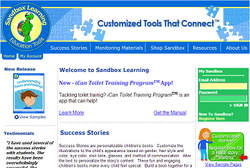 Site is flash based, content is text only, follows a space theme that is attractive to young children. Game play is very linear and somewhat slow. Users may also read model books on a variety of topics and learn about UDL principles. Website passed WAVE and follows good design principles while including images and text. The digital books created with Bookbuilder can be used to make accessible materials/content for users or create UDL designed content. Customized stories based on teacher/parent designed profiles for students that provide models for appropriate behaviors in a variety of situations and include coloring sheets and manipulatives. The actual product is easy to use and contains images and text that have good contrast and are well designed. The format for entering the profile information is text-based and not particularly user friendly. The customized books and manipulatives represent customized/individualized learning that is accessible or can be made accessible by using a variety of require accommodations.